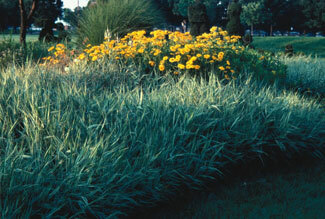 Ornamental grasses require relatively low levels of fertility. By keeping the level of nitrogen low, lodging or flopping over can be kept to a minimum. Leaf color and vigor are good guides to nitrogen requirements. Application of one-half to one pound of 10-10-10 fertilizer per 100 sq. ft. of garden area or about one-quarter cup per plant is sufficient. Apply fertilizer just as growth resumes in the spring. An application of a slow release fertilizer such as Osmocote in the spring is enough to take care of the plant's needs throughout the summer. Fertilizer should be watered in thoroughly. Grasses do not need to be cut down before winter. In fact, they are attractive when left standing and the foliage helps to insulate the crown of the plant. Cut back the foliage to about 4-6 inches in the spring before growth resumes. When foliage is removed, spring growth will begin earlier. Old foliage left on the plant can delay the crowns warming and subsequent growth by as much as 3 weeks. Division depends on the spacing and visual appearance of the plants as well as the overall health. Plants suffering from die-out in the center should be divided to improve appearances. Division is done in the spring before growth resumes or in the late summer or fall after the growing season. Plants that bloom late could be divided in the spring.